Winona, Minn. (AP) - Every day Minnesota schools fill our children's heads with knowledge and our landfills with trash. About a half-million pounds of worksheets, paper towels, milk cartons, glue bottles, notebook paper, discarded books, used Kleenex, juice boxes, worn out sneakers and the mystery-meat casserole judged inedible by half the third grade lands in wastebaskets, garbage cans and recycling bins in Minnesota public schools - about a half a pound per student per day. In the Winona school district, 23 dumpsters of varying sizes are parked behind district buildings to haul away the trash and recyclables collected from classrooms, cafeterias and offices - at the rate of nearly a ton a day if Winona students hold their own with their peers across the state. Bill O'Laughlin, district superintendent of buildings and grounds, doesn't track the tonnage hauled away by the district's solid waste contractor each year, but "it's a lot," he said. The district's 2010-11 rubbish removal contract for $37,502.40 is $2,183.97 less than the previous year, and O'Laughlin credits aggressive promotion of recycling and waste reduction with reducing both the cost and environmental impact of school trash. The Minnesota Pollution Control Agency conducted a study in April intended to gauge how much and what kind of solid waste comes out the back door of schools. For two days the agency collected, sorted, weighed, measured and analyzed the garbage and recyclables generated by six Hennepin County schools. The study, released in September, concluded that "while schools are all unique, it is also true that what is in school waste is fairly consistent from school to school," leading the researchers to believe the study findings are representative of all Minnesota schools. After sifting through the trash, the researchers concluded that 78 percent of school waste could either be recycled, composted or otherwise processed to keep it out of the landfill or incinerator. They found the largest fraction of the school waste stream was food from cafeterias - about 24 percent of the total, followed closely by recyclable paper at 23 percent. 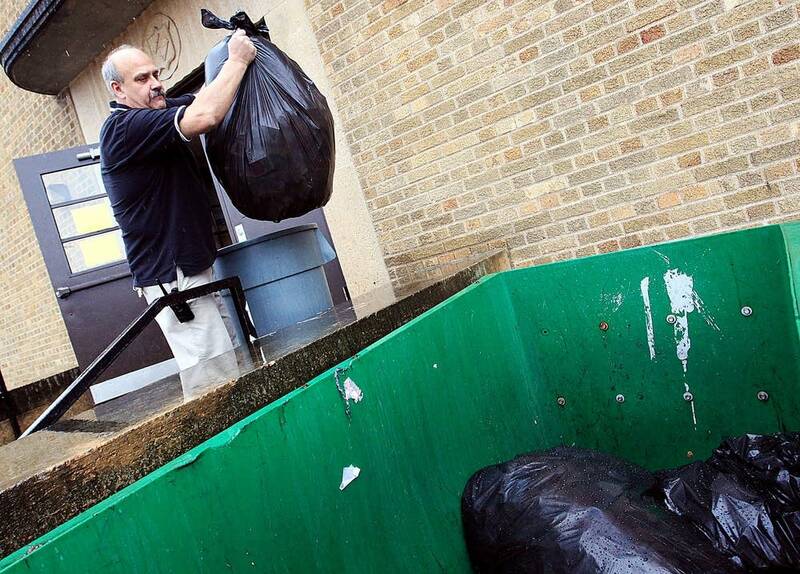 When it comes to trash going to the landfill, teachers, students and maintenance staff are working hard to keep Winona schools below average. Getting school lunches into the kids and out of the trash is a priority for district nutrition director Lyn Halvorson and her staff. A major innovation, piloted this year at Jefferson, Goodview and Washington-Kosciusko elementary schools, turns the traditional after-lunch recess on its head. Halvorson said that by sending the kids out to play before lunch, they burn off energy, work up an appetite and are ready to eat, then study when they come in off the playground. Food waste in the pilot schools is noticeably less than last year. To verify that informal observation, this spring the lunchroom trash at Madison will be monitored, and again after recess before lunch times are scheduled at that school next fall. 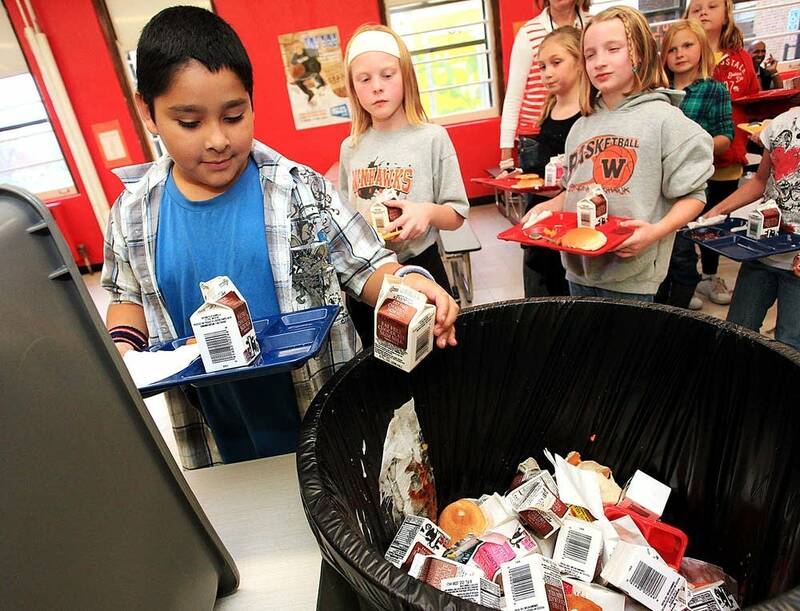 Encouraging students to take only what they will eat also helps hold down food waste. Students can refuse up to two items on the menu, Halvorson said, and having a variety of choices helps ensure that the food that ends up on children's plates is food they want to eat. The children's choices are important in menu planning, Halvorson explained. If an item isn't chosen at least 70 percent of the time, it's dropped from the menu rotation. But some food waste is inevitable. "Kids can be hungry and they load up with more than they can eat," Halvorson said. "Eyes will always be bigger than the stomach." O'Laughlin said the key to boosting recycling rates is to make it easy and automatic. Recycling containers are in every classroom, in the corridors and in common areas, and all of them feature "one stop shopping" - all recyclables go into one container and are sorted out after they've been collected. Along with the usual consumer recyclables - paper, soft drink cans and bottles - school policy requires the maintenance department to recycle all burned out fluorescent lights, computer equipment, televisions and other electronics, O'Laughlin said. Still, the most effective way to reduce waste is to use less in the first place. To cut down on paper use, all district printers are set to do double-side printing on multiple page print jobs and teachers and staff are encouraged to use "paperless" electronic communications whenever practical. The school district is an active participant in the Sustain Winona collaboration, which involves area schools, colleges and local government in a joint effort to reduce, reuse and recycle with an aim to reduce the community's carbon footprint. "We're trying to take a number of steps in the right direction," O'Laughlin said.